Hebridean Seaweed Company has agreements in place with the Crown Estate and local private estates to exclusively harvest ascophyllum nodosum throughout the Western Isles. The company also works closely with Scottish Natural Heritage and SEPA to ensure the seaweed harvesting is sustainable and environmentally friendly. Harvesting takes place all year round and the cutting is carried out either manually using a sickle or mechanically using a seaweed harvesting boat. The company uses the services of manual seaweed harvesters who cut the seaweed in designated areas. This pattern of work fits in well for the harvesters as they often combine the work with the traditional activities of crofting and fishing. When the tide is out the seaweed harvester will first encircle the chosen cutting area with a rope or net and will then cut within this area. When the tide comes back in the seaweed floats to form a large circular bail which is then towed by a small boat to a sheltered area for loading onto a lorry. The seaweed is cut about 12 inches from the base and the stump that is left will then regenerate in 3-4 years. Individual cutters handle their own cutting areas and rotate the areas cut to ensure sustainability. Hebridean Seaweed Company recently took delivery of a mechanical seaweed harvester (See Photo Gallery). This unusual vessel works close to the shore and cuts the seaweed as the stalks float above the seabed. The seaweed is then filled into sacks and towed by a small boat to a sheltered area for loading onto a lorry. This method of harvesting is environmentally friendly and sustainable as only the tops of the stalks are cut which allows the seaweed to regenerate in a relatively short period of time. 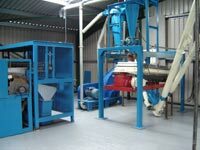 Following arrival at the processing facility the raw seaweed is gently dried in a tunnel drier and then milled to the customer’s specification. 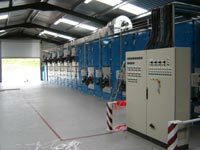 The modern machinery used allows the operators to control and monitor the process ensuring that the dried seaweed retains its original goodness so that only high quality finished products are produced.